Achieve a warm, inviting ambienceï¾‘without the hassle. Enjoy the relaxing visions and warmth of dazzling, dancing firelight with Ivation's Wall Mount Electric Fireplace. Our contemporary "fireplace" offers safe, cozy luxury without the need for firewood, gas, or exterior venting. 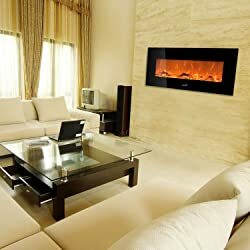 Perfect for both traditional and modern design aesthetics, the sleek 50-inch unit displays realistic LED flames for smoke and odor free viewing pleasure. Choose from 3 heat settings including a unique no-heat flame effect for hot summer months. For warmth, the fan-forced unit produces ample heat for areas up to 250 sq/ft. The handy remote control enables you to sit back and adjust your fireplace's brightness and temperature from afar. You can even program the shutoff timer up to 7.5 hours for hearthside bliss. Mount the glass-framed beauty below your television, under your mantle, or on a central wall for a gorgeous focal point. With easy instructions and an included mounting kit, you'll be cozying up in no time! Follow simple cleaning instructions for low-maintenance luxury! Area coverage: 250 sq. ft.